I really enjoyed delivering a keynote at NatWest’s Entrepreneurial Spark Hub in Leeds yesterday in support of their International Women in Business event #IWD2018. I talked about my own life and entrepreneurial journey, developing my mindset, overcoming my own limiting beliefs and impostor syndrome. It was an honour and privilege to be given a stage alongside some very inspirational women and audience of local female business leaders. Absolutely amazing presentation from the wonderful @jo_lockwood1965 at the Leeds Women in Business event. It was a very inspiring talk – it really connected with the audience and made us all laugh a lot too! The ‘imposter’ syndrome really struck home for me. It was fantastic, I was riveted to the spot and inspired beyond belief! Thank you Jo. Hi Joanne great to meet you yesterday, loved the presentation! Keep up the good work. Oh my goodness, it was so so so so so so so so so amazing to meet you today. Let’s connect. 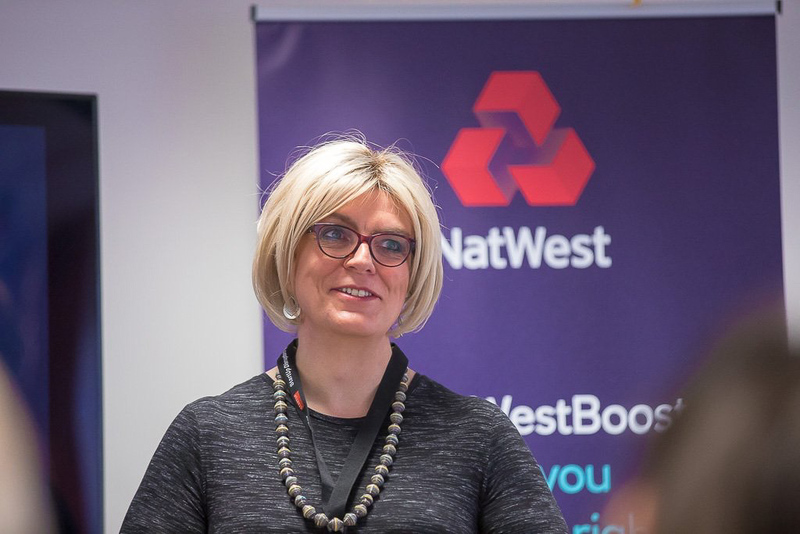 Joanne was a fantastic guest speaker at our NatWest Women In Business event! A really inspirational personal story which lit up the whole room. From a real struggle to a great success you should be very proud of yourself. I would jump at the opportunity to work with Joanne on future events and would encourage others to collaborate! I do hope our paths across again on a future event plus you continue to share your fantastic story and raise awareness for a real issues in our industry! Joanne came to our Leeds NatWest Entrepreneur Accelerator as one of the Inspirational speakers to celebrate International Women in Business Day. Joanne was instantly able to connect with her audience as an entrepreneur with years of credible experience but also as a human who has faced and overcome challenges. It was a superb session and I would highly recommend Joanne as a speaker. I first met Joanne on the Entrepreneurial Spark Accelerator Program in Portsmouth. During the 3 month program, I watched Joanne’s confidence in herself and her business flourish! Her vision for herself, her business and the world. So when I was asked to arrange a keynote speaker for our first event at the NatWest Entrepreneur Accelerator for International Women’s Day, Joanne was front of mind. Joanne was engaging, sharing her personal and entrepreneurial journey in a refreshingly honest and humourous way. All those in attendance we inspired by Joanne’s story. As always, an absolute pleasure working with you.